A matter-of-fact tone and brisk pace keep Winthrop's (The Little Humpbacked Horse) story of a girl dealing with her mother's chemotherapy treatments from slipping into the maudlin or melodramatic. Related in the first person, the tale convincingly covers young Sarah's gamut of emotions, from simply missing her mother during her hospital stays to reminiscing about times when things were normal (""I remember when I didn't have to tiptoe around the house and I could make as much noise as I wanted"") to anger at a schoolmate's comments about her mother's lack of hair. Lewin (Aunt Minnie McGranahan) echoes the strong emotional ties between Sarah and her parents with pen-and-ink close-ups of their interactions; she saves the few wider views of street scenes or hospital corridors to convey Sarah's feeling of inadequacy in protecting her mother (and herself) from the illness's effects. Several of the dialogues here could serve as models for parents struggling to explain terminal illness to a child. In the most moving example, as her mother's health improves, Sarah wants her to promise she won't be sick anymore. 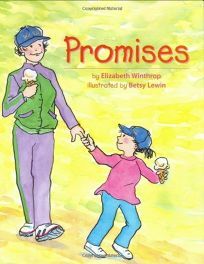 ""I can't make that promise, Sarah,"" her mother tells her, but consoles her with other more immediate promises--such as an ice cream date on the way home from the park. A responsible and poignant approach to a sensitive subject. Ages 5-8. (Apr.) FYI: A portion of this book's royalties will be donated to Cancer Care Inc.